decided to go for a sailing catamaran as our next boat. 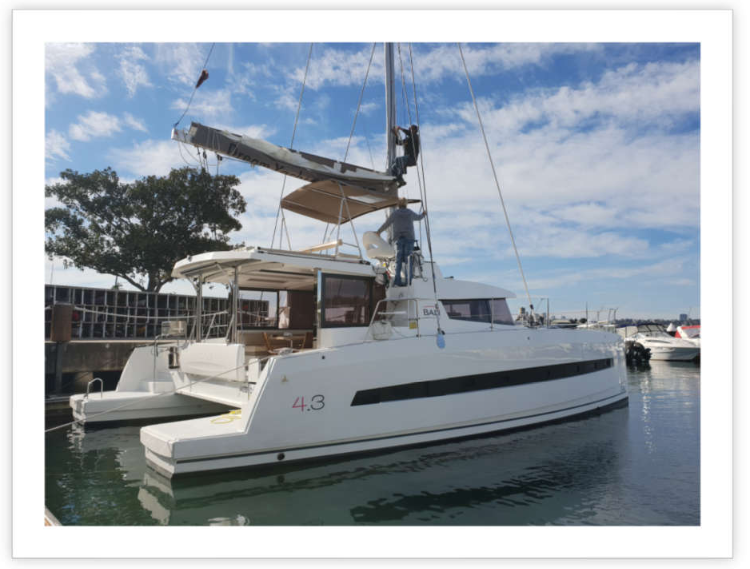 We arrived at Birkenhead Point Marina at 2pm to board the Bali 4.3 catamaran. Les the skipper was going to fix the ropes holding the main sail in place, which required someone climbing up the mast to do it. My husband Martin volunteered for this job and was hoisted up the mast. It’s his initiation on a sailing boat. No vertigo up there! Getting the provisioning sorted for the first leg of the trip up to the Gold Coast (where we’d get off the boat), we motored away from the marina at 4pm. The view from west of the Harbour Bridge was magnificent. Sitting on the corner chair in the front section of the boat and seeing the Opera House up close was also amazing. The city skyline was basked in the golden rays of the setting sun. Round the lighthouse on South Head, with a last glimpse of the Sydney skyline, we were out of the heads and in the open sea. Time to get the sails up. Alas, problem! The main sail wouldn’t go up because the ropes and strings were twisted and stuck. Lucky the wind was light and boat was stable in the gentle seas. Another trip up the mast to fix the strings, this time not having to climb too high. Just as it got dark, the main sail was up, head sail was unfurled, and away we went! I was blown away by how easy it was to handle the sails of the cat. Les only had to press a button, the main sail was pulled up by its designated rope through the pulley system – single handled operation completed within a minute. Same with the head sail, just a slight pull of the ropes and it opened up like a flower petal. None of the two people coordination with one person standing on each side of the boat and pulling hard on the ropes that we carried on while testing the boat in the Whitsundays. Les said this boat could be handled by one person easily, with all the controls centrally located. We’ve heard other cat owners tell us this, but seeing it in action with my own eyes confirmed it’s not a myth. The boat was travelling at 6-7 knots with one engine on initially, after a while, Les shut the engine. With apparent wind speed of 15-20 knots, the two sails kept up the 7 knot sailing speed. 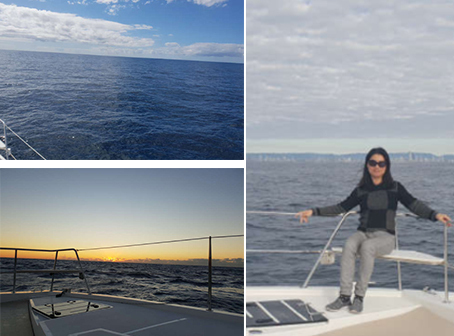 Without the engine noise and vibration, it was just the sound of water splashing against the boat – so peaceful. I walked out to the front section, where the lounge setting replaced the traditional trampoline on a typical catamaran (the Bali is not a typical cat – more on that later). Lying back and looking up, the stars were appearing thick and fast, the most obvious was Mars with its distinct red hue shining brightly above the horizon. Soon the sky was like a twinkling blanket covered with stars, some almost touching the gentle rolling sea. We had done some night cruising before but only for a very short time, when we had to move from one anchorage to another. Having never sailed through the night, I came with a mixed feeling of excitement and trepidation. But the cat was extremely stable under way. The seas were probably 1-2 meters, our monohull cruiser would have leaned left and right with the waves, but the cat was just staying flat on water, with only the tiniest of shaking motion. 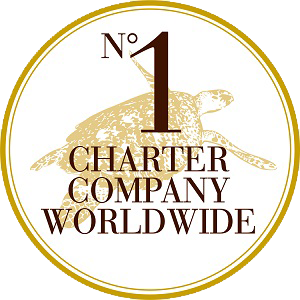 We were also with very experienced skipper and crew who’ve done the trip many times. It gave me the assurance that everything was going to be fine. We managed to cook a real meal while under way, pasta with porcini mushroom in cream source. Yum! We all sat around the large dining table in the dark, eating our dinner with a glass (nay, cup) of wine that’s not even shaking on a moving boat. The lights were turned off so Les could look through the large front window to observe what’s ahead of us without going up to the flybridge. I enjoyed watching the white waves produced by the wake at the back of the boat, as it was wide open and unobstructed. Les had opened the back door right up to the ceiling before we departed. Different to other cats, the Bali doesn’t have two sitting areas, an outside setting in the cockpit and inside setting in the saloon. Instead, it has a large table replacing the two smaller inside/outside tables, enclosed by a solid glass door. The ingenious design of the Bali 4.0–4.3 range has the back door engineered like a garage door that pivots open and folds inside the ceiling, creating an enormous indoor-outdoor space. This door would remain open for our entire trip. Lying down on the comfy mattress in the front cabin, the gentle rolling of the boat was like a cradle, the sound of the ocean a mellow lullaby. I thought I’d be asleep in no time, but the sound of water crashing onto the hull was just a tad too loud, accompanied by the occasional bang when an especially large wave hit the hull fully from front. From the cabin’s window the sea surface was about a meter below eye level. It felt like being in a vast embrace of the sea, the white froth of crashing waves becoming arms climbing up the side of the boat to caress the weary and tired. I stayed in this state of awe and fatigue throughout the night, not sleeping much. It was not until the early morning that I realised I could turn around and face the end of the bed, thereby avoiding the sound of waves splashing the hull in my ears. How dumb was that! Too late to enjoy any sleep at this stage though. With the horizon showing a sliver of orange, I decided to get up and watch the sunrise. Sitting on the lounge out the front, my favourite place on the boat, with a cup of coffee in hand, it was a perfect start of the day, even without much sleep. 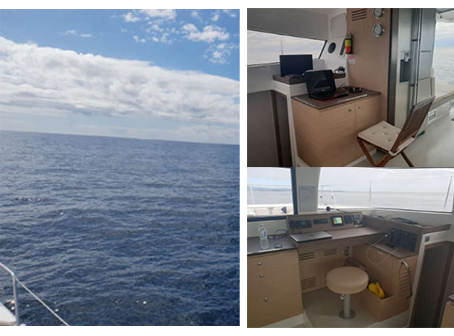 I found out during our test drive in June, that the Bali had a large enough inverter that powered a coffee machine, toaster, microwave as well as computers and phones while at sea. 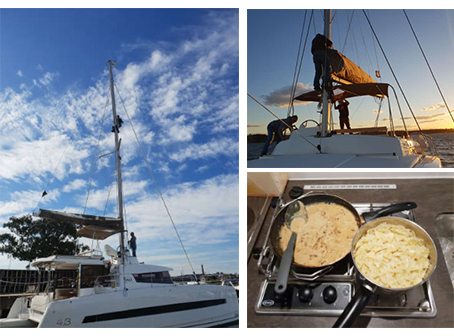 Our 36 foot cruiser didn’t have any of these luxuries – we had no toast bread for a whole year while living on our boat, and each time I worked on the laptop longer than a few hours we had to start the mobile generator to keep the laptop powered. Not to mention the 1.2 meter long table that served as dining table, study/work table, play area and the occasional converted bed. On the Bali 4.3, the main table itself is almost 2 meters long and can seat 8 people comfortably. Then there’s also the navigation area with its own fixed stool that I could use as a work desk. And the side buffet table that one could pull a chair up and use as a play/games/tv area. Back to the front lounge and my mission to catch the sunrise. It was not a wasted effort – I witnessed the sun pushing hard through the clouds, the pained labour of the brilliant lights hidden behind and restraint by the thick clouds, and finally the bright golden and orange rays bursting through the edges of the clouds. It was such a dramatic scene, almost brought tears to my eyes. Or is that the morning breeze? We had been sailing nonstop for more than 12 hours. The boat was steady as she goes. The sails were in their place, auto pilot was on, and there was nothing to do! Isn’t sailing considered a sport? This surely is a lazy man (and woman’s) sport. I read my book sitting out the front for hours, only interrupted by cruising or breaching whales in the distance. The most entertaining was a pair of mother and calf whales doing synchronised breaching in front of the boat, but too far to catch them perfectly on camera. The wind died down in the afternoon, so we had to start up an engine to keep the momentum. This went on throughout the night, and expected to last until tomorrow afternoon. So the engine was going to run for over 24 hours continuously. This would be a good test of the equipment. After a good night’s sleep, facing the right way in the cabin this time, I was too lazy to get up for the sunrise this morning. Instead, I watched it from the cabin through its oblong window. The clouds were not low on the horizon this time, so a perfectly formed round orange ball greeted me rising above the horizon. Another beautiful day! Standing on the side walk of the cat, which is almost a meter wide and allowing two people to pass comfortably, I glanced forward to the shining path on the sea lit by the rising run, and turned back for a minute. 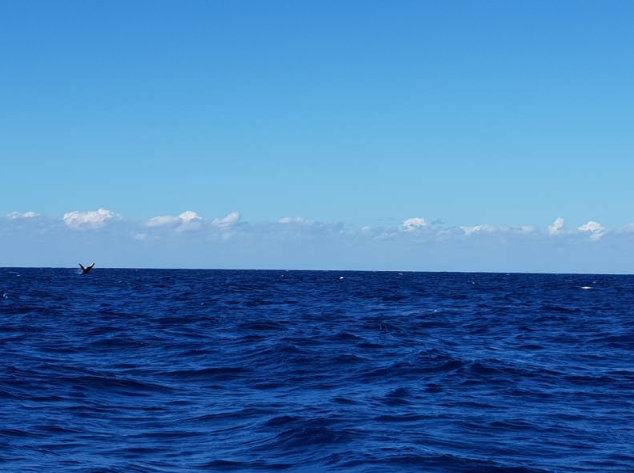 A calf of a whale jumped out of the water about 100 meters behind the boat, its entire body leaving the water for a few seconds, then plunging into the sea causing a not-insignificant splash. It was the most amazing scene, like a dream acting out in front of my eyes, appearing swiftly and disappearing just as fast. That was a nice wake up present! The calm weather since yesterday afternoon continued throughout today. The sea was like a lake, the waves had such a long frequency they were rolling gently like silky smooth undulating hills on the ocean surface. It was another day of reading a book, and frequently looking up for sea mammals such as whales and dolphins frolicking near and far. I saw a whale flipping its black and white fin majestically as if saying hello to us. There were pods of dolphins cruising past with their distinct humped backs slicing through the water. When the boat went through a group of sea birds resting on the sea, they started flapping their wings to take off and move out of our way, right before the bow of the boat. Although the engine was running, it was so quiet in the front of the boat I could hear nothing but the sound of wings flapping, it was surreal. After mid-afternoon, we were joined by some playful dolphins. 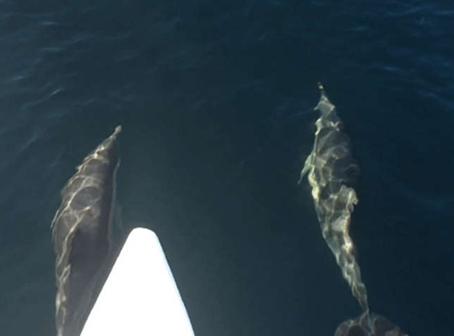 They decided to hang out with us, ride the bow waves and have a little competition with each other. Two were hugging the hulls on each side, a big one came from behind and chased one of them away, who jumped out of the water as if startled. They veered away then regrouped, always staying under and around the bows. Dolphins are such delightful creatures, I could watch them forever. After a while there were only two dolphins left hanging under the bows, then we realised they were actually scratching their backs underneath the hulls. I could almost see the satisfying grin on their faces when they had their backs scratched by the moving hulls. Then one turned on its side showing its much lighter coloured belly, and had its belly scratched as well. The other followed suit. It was like watching two kids enjoying their baths. This went on for a long time, before one swam close to the other, their heads touching for a split second then both swam away at the same time as if saying, “we’ve had enough pampering let’s go have dinner now”. The night was becoming balmier as we approached the northern tip of NSW. Apparently we would cross the state border overnight and arrive on the Gold Coast in the morning. The trip was going too fast for my liking. After dinner I found myself lying on the rooftop double mattress behind the flybridge. The night sky was dissected by the upright main sail. The milky way was clear and obvious like a wide silver band weaving through the sky. There was a cluster of stars forming an almost perfect circle right next to the top of the mast. Now I wished I had put more effort when I was younger in learning the constellations so I could wander from one group to the next and revel in all the stories and legends behind the stars and constellations. We approached the Gold Coast just after sunrise. There was a thick layer of low lying clouds in the morning, so the sky appeared grey. It didn’t stop us from spotting whales and dolphins. There was a whale breaching between our boat and the skyscrapers lining the coast. It would have been an iconic picture, had we had the phone or camera with us at that moment. Nevertheless, welcome to the Gold Coast with its famous skyline. The head sail was furled in without any effort, and with the flick of a switch, the main sail came down on its own pulled by gravity. The engine had been running nonstop for one and a half days by now, and it’s as smooth as in the beginning. 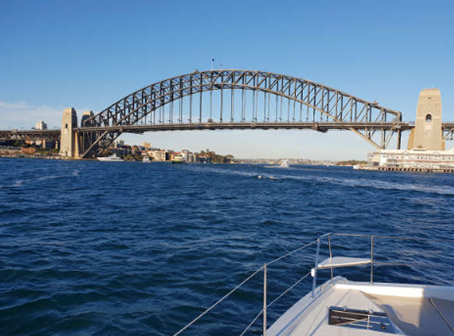 With both engines now switched on, we entered the Gold Coast seaway and our learning (but actually do-nothing and idyllic) sailing trip came to an end. It’s a very short two days and three nights. But long enough to get me hooked on sailing in a catamaran. I could even imagine doing an ocean crossing like this, with the days stretching as far as the ocean underneath the boat.